The alarm was raised last night and a fire was extinguished in the lobby. 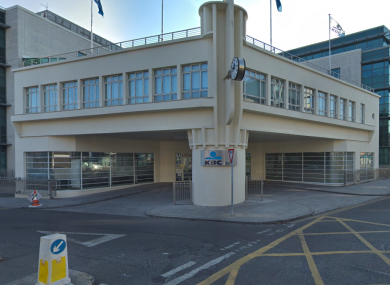 GARDAÍ IN DUBLIN are investigating a fire at a KBC bank building in Dublin city centre. The incident occurred on Sandwith Street, Dublin 2 last night. The alarm was raised at approximately 11.25pm. Dublin Fire Brigade also attended the scene and extinguished a fire in the lobby of the premises. Windows were also damaged in the incident, and the scene has been preserved for technical examination. Gardaí in Pearse Street are appealing for witnesses or anyone with information to contact them on 01 666 9000, the Garda Confidential Line 1800 666 111 or any garda station. KBC has been in the news this week, after a protest took place at its Baggot Street branch over an eviction last weekend in Roscommon. Email “Gardaí investigating fire at KBC building in Dublin city centre”. Feedback on “Gardaí investigating fire at KBC building in Dublin city centre”.